Jeitais a Lebanese town located in the Keserwan District in the Mount Lebanon Governorate. The town is about 20 kilometres north of Beirut. 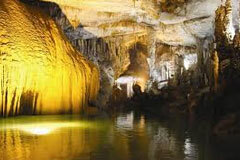 It is famous for the Jeita Grotto which is a popular tourist attraction. The Jeita cave is situated at the center of the western flanks of the Lebanon mountains, more specifically in the Nahr al-Kalb valley, its natural entrance is about 100 metres above sea level. The Jeita caves are solutional karst caves which have formed over millions of years due to the dissolution of limestone. The limestone is dissolved by carbonic acid charged rain water and groundwater. when the limestone, which is originally water proof, contains cracks produced by tectonic forces the water oozes into the rock and starts to widen the cracks and solute caves inside the layers. 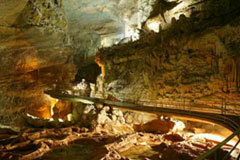 Jeita is the longest cave complex in the Middle East. Where the visitor will have a walking tour and be staggered at the view of extraordinary stone forms of curtains, columns, draperies and mushrooms at a distance of some 750m explored for 2200m. The upper gallery is famous for its formations, lit by an effective lighting system. It is entered through a 117 metres (384 ft) long concrete tunnel. The part accessible by visitors has three huge chambers. The first is called White Chamber, the second Red Chamber, due to the color of the formations. White dripstones are pure calcite without defilement, the red color is given by iron oxide (rust) in small amounts. Where the visitor can take a short dreamy cruise in a rowboat at a distance of some 400m explored for almost 7800m and marvel at the majestic forms of otherworldly concretions. it is traversed by a smooth underwater river and a lake (the "Dark Lake"). The river is broken up by several small cataracts and rapids. The lower cave's "Thompson's Cavern", is a massive hall with impressive speleothems such as the Eagle Obelisk stalagmite. Other halls in the lower gallery include the Pantheon, Grand Chaos and Shangri-la. 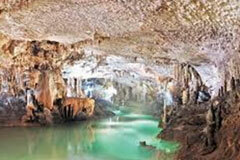 Today, the Jeita Grotto is a popular recreational show cave and a major tourist attraction. It hosts approximately 280,000 visitors per year. Jeita grotto contains a lot of touristic attractions that fill the visitor’s time with enjoyment and happiness, The attractions include ropeways, train, miniature zoo, gardens and many sculptures.